Background COACH syndrome is a rare autosomal recessive disorder characterised by Cerebellar vermis hypoplasia, Oligophrenia (developmental delay/mental retardation), Ataxia, Coloboma, and Hepatic fibrosis. The vermis hypoplasia falls in a spectrum of mid-hindbrain malformation called the molar tooth sign (MTS), making COACH a Joubert syndrome related disorder (JSRD). Methods In a cohort of 251 families with JSRD, 26 subjects in 23 families met criteria for COACH syndrome, defined as JSRD plus clinically apparent liver disease. Diagnostic criteria for JSRD were clinical findings (intellectual impairment, hypotonia, ataxia) plus supportive brain imaging findings (MTS or cerebellar vermis hypoplasia). MKS3/TMEM67 was sequenced in all subjects for whom DNA was available. In COACH subjects without MKS3 mutations, CC2D2A, RPGRIP1L and CEP290 were also sequenced. Results 19/23 families (83%) with COACH syndrome carried MKS3 mutations, compared to 2/209 (1%) with JSRD but no liver disease. Two other families with COACH carried CC2D2A mutations, one family carried RPGRIP1L mutations, and one lacked mutations in MKS3, CC2D2A, RPGRIP1L and CEP290. Liver biopsies from three subjects, each with mutations in one of the three genes, revealed changes within the congenital hepatic fibrosis/ductal plate malformation spectrum. In JSRD with and without liver disease, MKS3 mutations account for 21/232 families (9%). Conclusions Mutations in MKS3 are responsible for the majority of COACH syndrome, with minor contributions from CC2D2A and RPGRIP1L; therefore, MKS3 should be the first gene tested in patients with JSRD plus liver disease and/or coloboma, followed by CC2D2A and RPGRIP1L. Liver biopsy findings in patients with COACH syndrome. (A) Ductal plate malformation, fetus with MKS: the portal triad with ductal plate malformation has a ring of irregularly shaped and dilated bile duct structures that parallel the limiting plate. Trichrome, 150×. (B) Normal liver, 4 years: the portal triad contains a bile duct (lower left lumen), hepatic artery (lower right lumen) and portal vein (upper lumen) within a minimal amount of supporting fibrocollagen. Trichrome, 300×. (C) UW65, 11 months: the portal triad is expanded by minimal fibrosis and too many duct profiles, located both at the limiting plate and within the connective tissue. Trichrome, 200×. (D) UW65, 9 years: the portal triad has moderate fibrosis and an excess of bile ducts and hepatic artery branches with only minimal inflammation. Trichrome, 200×. (E) UW49, 10 years: the explanted liver has dense portal fibrosis that extends between triads and focally forms nodules. Trichrome, 20×. (F) UW49, 10 years: a portal triad in the explant shows moderate fibrosis and several irregular bile duct profiles. Trichrome, 300×. (G) UW04-3, 5 years: the liver biopsy has intact lobular architecture with portal fibrosis and occasional septa bridging portal areas. Trichrome, 20×. (H) UW04-3, 5 years: a representative portal area shows several profiles of bile ducts and hepatic artery branches within dense fibrocollagen; central clear lumen is a normal portal vein branch. Trichrome, 300×. Marked genetic heterogeneity exists for JSRD and MKS. Mutations in seven genes (NPHP1, AHI1, CEP290, RPGRIP1L, MKS3/TMEM67, CC2D2A and ARL13B) and two additional loci (9q34, pericentromeric chromosome 11) have been associated with JSRD,17–30 but these account for only approximately 50% of patients. MKS1 and MKS3 are each estimated to contribute to a variable percentage of total MKS patients, highly dependent on ethnic background.31–34 Several of the genes responsible for JSRD (CEP290, RPGRIP1L, MKS3/TMEM67, CC2D2A) also cause MKS.20 22 35–38 This overlap is not completely unexpected given that the genes responsible for JSRD and MKS are implicated in primary cilium/basal body function, and both physical and genetic interactions between these proteins/genes have been demonstrated.38 Given the shared genetic causes of MKS and JSRD, the underlying pathophysiology of liver disease in COACH syndrome is likely to lie within the same spectrum as MKS. Recently, Brancati et al39 identified MKS3 mutations in more than half of probands with COACH syndrome, defined as JSRD with CHF; however, the contribution of MKS3 mutations to JSRD as a whole was not reported. In this work, we demonstrate that MKS3 mutations account for 9% of families in a large JSRD cohort, and that MKS3 mutations occur almost exclusively in the JSRD plus clinically apparent liver disease (COACH) subtype. In addition, we found RPGRIP1L and CC2D2A mutations in families with COACH, and collectively, these three genes account for up to 96% of families with COACH in our cohort. In cooperation with the Joubert Syndrome Foundation & Related Cerebellar Disorders and clinical collaborators throughout the world, the University of Washington (UW) Joubert Center has enrolled >250 families with JSRD under an approved protocol through the Human Subjects Division at the University of Washington. All subjects in the cohort have clinical findings of Joubert syndrome (intellectual impairment, hypotonia, ataxia) and supportive brain imaging findings (MTS on MRI or cerebellar vermis hypoplasia on computed tomography (CT) scan). For subjects without brain MRI studies, vermis hypoplasia was considered a sufficient imaging criterion. Diagnosis of CHF was based on medical record review using any one of the following criteria: histopathological evidence of hepatic fibrosis from either biopsy or autopsy, hepatic ultrasound/MRI imaging findings consistent with fibrosis or bile duct dilatation, otherwise unexplained elevated serum transaminases, hepatomegaly, portal hypertension, portosystemic shunting, or liver transplantation. Patients with an alternative cause for liver disease (medication, infection, inflammation) were excluded. Other features including coloboma, retinal disease, renal disease, polydactyly, and encephalocele were identified based on parent/physician report or medical record review. Ocular coloboma was not required for the COACH diagnosis. Renal disease was collated and assigned to the following categories using clinical, imaging and histopathological data, as available: (1) nephronophthisis, or (2) macrocystic renal disease, or (3) other renal disease as reported. These criteria were also applied to interpretation of historical reports of COACH syndrome. This 9-year-old male (UW65) was initially evaluated in his first year of life for macrocephaly, overgrowth, hypotonia and developmental delay (figure 2A). At 16 months, ophthalmologic evaluation revealed rotatory nystagmus, OMA, reduced visual acuity and bilateral inferior chorioretinal colobomas, sparing the macula. A brain MRI demonstrated the MTS (figure 2B,C), and he manifested developmental delay and an ataxic gait (walking independently from 8 years of age). At 9 years, he uses two words, follows complex commands, reads and types at a basic level, and can do multiplication (figure 2D). Facial features, brain imaging and mutations for UW65 and UW49. (A) UW65 at 11 months of age. (B and C) Sagittal T1 weighted and axial T2 weighted brain magnetic resonance images demonstrating the molar tooth sign. (D) UW65 at 9 years of age. (E) MKS3 sequence tracings for UW65. (F) UW49 at 20 years of age. Photographs printed with permission from the families. 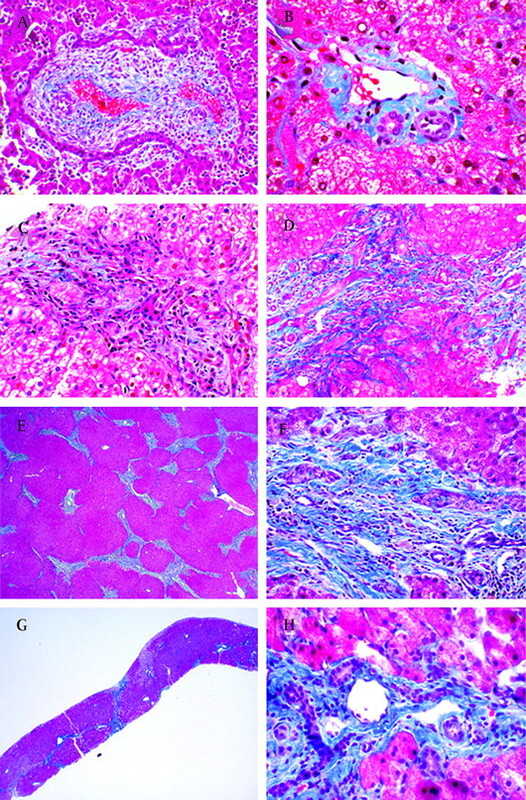 By 11 months of age, palpable hepatosplenomegaly with fourfold elevated liver enzymes (aspartate transaminase (AST) 250 IU/l, alanine aminotransferase (ALT) 236 IU/l) prompted liver biopsy which demonstrated minimal portal fibrosis and excess of ductal elements (figure 1C). At age 6 years, he had normal serum transaminases but “slightly coarsened” hepatic echogenicity on abdominal ultrasound. At 9 years, mildly elevated serum transaminases (AST 73 IU/l, ALT 92 IU/l) and borderline splenomegaly prompted a second liver biopsy which demonstrated progression of hepatic fibrosis with numerous duct profiles in portal triads (figure 1D). Currently, his renal function remains intact. Testing for the genes associated with JSRD revealed compound novel missense mutations in the MKS3 gene (figure 2E), with one mutation confirmed to be inherited from his mother (paternal sample not available). This 22.5-year-old female (UW49), briefly reported in Gorden et al (2008), has speech dyspraxia, reads at the 6th grade level, and uses a wheelchair for mobility (figure 2F). She has moderate intellectual disability (full scale IQ = 41) and completed high school in a regular classroom with a full time aide. She had apnoea and tachypnoea as an infant, with episodic events persisting into maturity. Ophthalmological evaluation revealed OMA, strabismus, and bilateral small chorioretinal colobomas inferior to the optic nerves. Cerebellar vermis hypoplasia, agenesis of the corpus callosum and hydrocephalus were identified on head CT scans. Ventriculoperitoneal (VP) shunt, strabismus, ptosis, bilateral inguinal hernia and tongue reduction surgeries were required. This 17.5-year-old male (UW04) presented at age 15 months with hypotonia, developmental delay, alternating hyperpnoea/apnoea and OMA. Brain MRI at 9 months of age demonstrated the MTS. His younger brother had a very similar neonatal course with milder OMA, plus unilateral ptosis, strabismus and autistic behaviours. By the age of 5 years, he manifested ataxia and was diagnosed with chronic anaemia and progressive renal insufficiency (blood urea nitrogen (BUN) 96 mg/dl and creatinine (Cr) 6.7 mg/dl). A renal ultrasound showed diffusely echogenic kidneys of normal size. Combined renal and liver biopsies were performed. The liver demonstrated mild to moderate portal fibrosis with focal portal–portal bridging without inflammation or cholestasis (figure 1G); many triads contained an excess number of ducts (figure 1H). Neither biliary stasis nor an inflammatory process was present. The renal biopsy showed marked interstitial fibrosis and inflammation with tubular atrophy consistent with nephronophthisis. Peritoneal dialysis was required followed by renal transplantation at 6 years of age. Compound heterozygous mutations (nonsense and missense) in the RPGRIP1L gene were identified in this patient (table 1) and his affected brother who required kidney transplantation but has no clinical evidence of liver disease at 16 years of age (table 2). In our JSRD cohort of 251 families, 26 subjects (14 male, 12 female) in 23 families met criteria for COACH syndrome, defined as JSRD plus clinically apparent liver disease (see Methods). Most of the subjects were ascertained in the USA (European, Asian, African, and Native American descent), with one family each from Italy, the Netherlands, Germany, the UK, and Turkey. No families were reported to be consanguineous. The mean age of last ascertainment was 9 years with a range of 0–22 years. Developmental delay/intellectual disability, hypotonia and abnormal eye movements were invariant features. Assignment of CHF was made by histopathological means in 18 of 26 cases (63%). The DPM was reported in 1 of 24 subjects (4%), with cirrhosis or chronic hepatitis observed in two of 24 subjects (8%). Pathological features of cholangitis were not seen in any subjects. Portal hypertension developed in four subjects (17%) and hypersplenism in one (4%) with portosystemic shunting required in one (4%), and liver transplantation in two (8%). No deaths thus far have resulted from liver disease. Colobomata were present in 17 subjects (71%) and renal disease was present in 10 subjects (42%): five with nephronophthisis (or likely nephronophthisis) and six with macrocystic kidney disease. Chronic renal insufficiency or end stage renal disease (ESRD) occurred in three (13%) and renal transplantation was required in two (8%), with no deaths from renal complications. Additional features included encephalocele (4%), abnormal respiratory control (80%), hypoplasia/agenesis of the corpus callosum (8%), ptosis (25%) and intestinal malrotation (8%). No subjects had polydactyly or retinal dystrophy. The identification of MKS3, CC2D2A and RPGRIP1L mutations in JSRD patients with liver fibrosis prompted us to evaluate all of our COACH patients for mutations in these three genes. In subjects who did not have conclusive MKS3 mutations, we sequenced CEP290, since CEP290 mutations have been associated with both MKS and JSRD. These probands (UW52, UW58, UW59 and UW72) did not have mutations in CC2D2A, RPGRIP1L, CEP290, AHI1 nor deletion of the NPHP1 gene. One proband (UW66) lacked mutations in MKS3, CC2D2A, RPGRIP1L, CEP290, AHI1 and deletion of the NPHP1 gene. Affected subjects in 16 pedigrees (70%) had two mutations in the MKS3 gene, while one family carried two possible mutations (see below), and single mutations were found in an additional three subjects in two families (table 1). The 17 subjects with two mutations had either: (1) two missense mutations (n = 8); or combinations of (2) one missense and one nonsense mutation (n = 4); (3) one missense and one splice site mutation (n = 4); or (4) one nonsense mutation and one possible splice site mutation (n = 1). The splice site mutation in UW05 (c.1674+3A>G) results in the use of a cryptic splice site 124 nucleotides within intron 16, creating a stop codon one amino acid after exon 16. We were not able to directly assess the functional significance of the splice site changes in UW59 (intron 25, c.2661+5G>A) and UW57 (intron 9, c.978+3A>G) because we do not have cell lines from these subjects; however, the mutations greatly decrease the predicted strength of the donor sites in multiple splice site modelling programs (see Methods). To determine whether MKS3 mutations were more prevalent in COACH subjects compared to JSRD subjects without liver disease, we sequenced MKS3 in probands from our entire cohort of JSRD families without liver disease, excluding 41 families with causal mutations in other JSRD genes (n = 168). We identified mutations in four subjects from two families for a prevalence of ∼1% in JSRD families lacking evidence of CHF (table 2). Previously unreported changes in residue 82 (p.P82R and p.P82S) were seen in both of these families in trans with p.M252T in UW85 and a frameshift p.T193Tfs14X in UW86. In our entire JSRD cohort, regardless of the presence or absence of liver disease, 9% (21/232) of families had MKS3 mutations. In contrast to the high correlation between liver disease and MKS3 mutation status, MKS3 mutations were identified in 16/30 (53%) families with coloboma, irrespective of liver disease: 15/16 (94%) COACH families with coloboma carried at least one MKS3 mutation, while only 1/14 (7%) families with coloboma but lacking clinically apparent liver disease carried at least one MKS3 mutation. MKS3 mutations were distributed throughout the protein (figure 3), with the majority of the missense mutations located in the N-terminal extracellular domain. Of the 20 missense mutations identified in MKS3 probands, nine were novel (P82R, P82S, K99N, R172Q, M257V, R441C, P485S, Q841P, F942C). Although Q376E is a unique substitution, Q376P has been reported earlier.37 These novel missense mutations were predicted to be either possibly or probably damaging by PolyPhen42 and were excluded as rare polymorphisms based on testing at least 210 control chromosomes. When possible, familial segregation of mutations (n = 7) to exclude in cis inheritance of a variant were confirmed (table 1). Five missense mutations, M252T (n = 2), L349S (n = 2), Y513C (n = 2), C615R (n = 2), and I833T (n = 4) were recurrent within the cohort. The phenotype of subjects with MKS3 mutations does not differ markedly from the subjects without MKS3 mutations in our cohort. MKS3 mutations in COACH and Meckel syndromes. MKS3 encodes a 995 amino acid predicted protein with a signal peptide (sig), cysteine rich region, three transmembrane (TM) domains and a coiled-coil (CC) domain. Mutations identified in JSRD/COACH patients are listed above the protein diagram while mutations found in MKS patients are listed below. Previously unreported mutations are indicated with an asterix (*) and mutations also observed by Brancati et al39 are indicated with a plus sign (+). The affected subjects in UW49 and UW67 had truncating CC2D2A mutations in combination with missense mutations (table 1). Discordance for liver disease between siblings was observed in UW04, where a combination of missense and nonsense mutations in RPGRIP1L was identified as being causative; however, only one sibling had a liver biopsy as part of his evaluation before renal transplantation. The phenotype of these subjects is indistinguishable from the subjects with MKS3 mutations; however, all three COACH subjects with CC2D2A and RPGRIP1L mutations manifested renal disease. In contrast to MKS3, the prevalence of CC2D2A mutations was similar in the COACH cohort (2/23–9%) and the entire JSRD cohort (17/183–9%). Likewise, the prevalence of RPGRIP1L mutations was similar in the two cohorts (1/23–4% vs 4/174–2%). A comprehensive review of the medical literature, using the same criteria for COACH syndrome, revealed 43 patients with COACH syndrome from 26 families, including 21 males, 13 females, three fetuses of unknown gender, and 13 sets of siblings (table 3).1 3 22 26 39 47–61 Two terminated fetuses assigned a Joubert syndrome diagnosis by Baala et al had cerebellar vermis hypoplasia, enlarged microcystic kidneys and hepatic fibrosis determined by autopsy.22 The mean age at last follow-up of patients in the literature was 14.5 years (range 0–46 years) versus 8.9 years (range 0–22 years) for our cohort. MKS3 mutations were reported in 19 subjects from 11 families, with all but two subjects from one family having two mutations. Additionally, RPGRIP1L mutations were reported in two subjects (only one mutation was identified in one of the two subjects). Mutation testing was not reported in the remaining 22 subjects in 16 families. We compared the frequency of clinical findings/complications in our cohort of COACH patients (this work) to all reported COACH patients (literature) and all reported COACH patients, with and without MKS3 mutations (table 4). Despite the substantial ascertainment bias and differential reporting of clinical features, this analysis gives some sense of the frequency of complications seen in COACH syndrome. The results for the literature as a whole are biased toward COACH syndrome caused by MKS3 mutations, since Brancati et al39 describe their eight families with MKS3 mutations and not the six families without MKS3 mutations. Combining our COACH patients with MKS3 mutations with the similarly ascertained patients described by Brancati et al39 provides estimates of features/complications in this select group. Our cohort provides the only estimate of complications in JSRD patients with MKS3 mutations independent of liver disease status, since Brancati et al39 did not report MKS3 mutation analysis in their JSRD patients without clinically apparent liver disease. The liver disease in our cohort encompassed multiple outcomes ranging from asymptomatic elevation of liver enzymes to organomegaly and portal hypertension and is comparable to patients described in the literature. The renal disease in patients with and without MKS3 mutations ranged from prenatal onset MKS-like cystic renal dysplasia31 33 to an infantile onset ARPKD-like presentation,62 to early childhood onset cystic dysplasia,39 and to late childhood/adult onset nephronophthisis.22 Severe liver and renal complications (death, porto-systemic shunt, dialysis or transplantation) were somewhat more frequent in the literature, possibly due to the older age at last ascertainment, preferential reporting of more severe cases with renal disease,50 53 56 58 59 differences in medical practice, and/or the highly variable nature of disease progression.16 The frequency of coloboma (64% vs 71%), encephalocele (0% vs 7%), polydactyly (0% vs 5%), and ptosis (16% vs 25%) were similar across groups. We have identified the genetic bases of COACH syndrome (JSRD with liver disease) in the largest cohort of such patients published to date, finding mutations in all but one of 23 families. Mutations in MKS3 account for the vast majority of COACH subjects, while CC2D2A and RPGRIP1L mutations account for a minority. By contrast, MKS3 mutations were uncommon in JSRD subjects lacking clinically apparent liver disease. Furthermore, only 2/20 families (4/23 subjects) with JSRD due to MKS3 mutations did not have liver disease, confirming this highly specific genotype-phenotype correlation. Brancati et al39 described a 57% prevalence of at least one MKS3 mutation in their cohort of 14 similarly ascertained families, giving a prevalence of 73% in our combined cohorts which were ascertained in a similar manner. Based on our observations, mutations in MKS3 are rarely seen in JSRD patients without liver disease; however, the full phenotypic spectrum of MKS3 related ciliopathy may be even broader, given the report of a patient with a homozygous MKS3 mutation but minimal neurological involvement.62 Although patients with liver involvement may be somewhat over-represented in our cohort, MKS3 mutations account for 9% of our JSRD subjects irrespective of liver involvement, on par with the other major JSRD genes AHI1, CC2D2A and CEP290. The striking association of MKS3 mutations with liver disease in JSRD contrasts with the less clear-cut genotype–phenotype correlations observed for other JSRD genes that have hindered selective gene testing. Among these correlations, retinal dystrophy is seen in most subjects with AHI1 mutations, many with CEP290 mutations and few with RPGRIP1L mutations.17 19 20 21 29 63 64 Renal disease is seen in virtually all subjects with NPHP1 deletions, many subjects with RPGRIP1L and CEP290 mutations, but very few with AHI1 mutations.25 65–68 Other features may help distinguish patients with MKS3 mutations, since we observed coloboma and renal disease in substantial subsets of our subjects, while polydactyly and retinal disease were absent. These findings have clear clinical implications for JSRD patients with liver disease: MKS3 should be tested first, followed by CC2D2A and possibly RPGRIP1L. The spectrum of MKS3 mutations differs between JSRD and MKS subjects. We and others have identified single MKS3 mutations in both JSRD and MKS, consistent with the presence of second non-coding mutations in MKS3 versus the possibility of oligogenic inheritance seen in other ciliopathies such as Bardet–Biedl syndrome and nephronophthisis.69–72 Many subjects with JSRD/COACH carry compound missense mutations, while this has been reported in only one subject with MKS.22 Both families with JSRD due to MKS3 mutations, but no clinically apparent liver disease, have mutations that alter the proline at residue 82; however, the significance of this finding is unclear and will need to be evaluated in additional patients. MKS is typically caused by combinations of missense and truncating mutations or homozygous splice site mutations.22 31 33 37 No JSRD and MKS subjects have the same combination of mutations and only two nonsense mutations (R208X, R451X) and a single missense mutation (L349S) are shared between the cohorts. These data suggest that MKS may be caused by more severe loss of MKS3 function than JSRD. We report clinical features of all patients with COACH syndrome in a cohort of JSRD patients ascertained only by brain imaging findings, in contrast to case series in the literature that ascertained patients specifically for brain, liver and sometimes renal involvement. Brancati et al39 report a relatively large number of families ascertained by brain imaging findings, but only subjects with MKS3 mutations are described in detail. The reported complications from portal hypertension with potentially fatal variceal bleeding highlight the need for close monitoring of these patients.3 50 52 55 57 73 The presence of liver disease associated with mutations in multiple JSRD genes (MKS3, CC2D2A, RPGRIP1L and CEP290) raises the question of whether subclinical liver involvement is present in many more subjects with JSRD, and if present, whether subclinical disease ever becomes clinically significant. Pathological findings in the livers of the three subjects with MKS3, CC2D2A and RPGRIP1L mutations were compatible with the variable changes seen in CHF, including an excess of bile duct profiles and progressive portal fibrosis in the subject for whom serial biopsies were available. Although cirrhosis/chronic hepatitis is not typical for CHF the cirrhosis reported in 2/40 postnatal COACH subjects may be due to prior cholangitis, a known complication of CHF, (described in 4/40 COACH patients) versus misclassification of the clinical biopsy findings. The proposed ciliary function for MKS3, CC2D2A and RPGRIP1L supports a unified underlying pathophysiology for liver disease in JSRD and MKS. Coloboma is not an invariant feature of COACH patients defined by the presence of the MTS and liver disease, and in this regard diverges from the original specification of COACH syndrome.1 Nonetheless, in our cohort, coloboma was associated with liver disease (50% of the time) and MKS3 mutations (53% of the time). These associations are also present in the cohort described by Brancati et al.39 Therefore, monitoring for liver disease and MKS3 testing are indicated in all JSRD subjects with coloboma. Nephronophthisis and larger, mixed size renal cystic disease appear indistinguishable at the histopathological level,74 consistent with a renal MKS3 spectrum. Direct comparison with the literature cohort is also problematic as juvenile nephronophthisis manifests with renal failure at a mean age of 13 years,75 close to the mean age of the literature cohort, versus our UW-MKS3 cohort mean (8.9 years). Overall, 12% of the combined cohorts of comparably ascertained MKS3 cases had chronic renal failure or ESRD, with one subject receiving a renal transplant (3% prevalence). Due to the high risk of renal disease, COACH syndrome patients should be closely monitored for renal disease regardless of mutation status. We have identified the genetic cause for the majority of JSRD patients with liver involvement, also known as COACH syndrome. Pre-symptomatic, gene based diagnosis of MKS3 mutations should make it possible to deliver improved medical and surgical care for the liver and renal complications associated with substantial morbidity and mortality. Assuming that our JSRD cohort reflects JSRD in the population, patients with known liver involvement should be tested first for MKS3 mutations, followed by CC2D2A and RPGRIP1L. We thank all the participating families with Joubert syndrome, the Joubert Syndrome Foundation and Related Cerebellar Disorders, and Roger Fick for help collecting clinical information. Photographs were printed with permission from the families.
. Further delineation of a syndrome of cerebellar vermis hypo/aplasia, oligophrenia, congenital ataxia, coloboma, and hepatic fibrosis. Am J Med Genet 1989;32:227–32.
. Cerebello-oculo-renal syndromes including Arima, Senior-Loken and COACH syndromes: more than just variants of Joubert syndrome. Am J Med Genet 1999;86:459–69.
. Molar tooth sign of the midbrain-hindbrain junction: occurrence in multiple distinct syndromes. Am J Med Genet 2004;125A:125–34; discussion 17.
. Molar tooth sign in Joubert syndrome: clinical, radiologic, and pathologic significance. J Child Neurol 1999;14:368–76.
. Joubert syndrome: a review. Am J Med Genet 1992;43:726–31.
. Follow-Up in Children with Joubert Syndrome. Neuropediatr 1997;28:204–11.
. Joubert syndrome. In: GeneReviews at GeneTests-GeneClinics: Medical Genetics Information Resource (database online). Copyright, University of Washington, Seattle 1997–2007 Available at at http://wwwgeneclinicsorg or http://wwwgenetestsorg. Vol 2007. Seattle, 2007.
. Clinical features and revised diagnostic criteria in Joubert syndrome. J Child Neurol 1999;14:583–90; discussion 90–91.
. The face of Joubert syndrome: a study of dysmorphology and anthropometry. Am J Med Genet A 2007;143A:3235–42.
. Meckel-Gruber syndrome: pathologic manifestations, minimal diagnostic criteria, and differential diagnosis. Arch Pathol Lab Med 2006;130:1236–8.
. Spectrum of anomalies in the Meckel syndrome, or: “Maybe there is a malformation syndrome with at least one constant anomaly”. Am J Med Genet 1981;9:67–73.
. The Meckel syndrome: clinicopathological findings in 67 patients. Am J Med Genet 1984;18:671–89.
. Meckel syndrome. J Med Genet 1998;35:497–501.
. Molecular pathology and genetics of congenital hepatorenal fibrocystic syndromes. J Med Genet 2003;40:311–9.
. Study of the malformation of ductal plate of the liver in Meckel syndrome and review of other syndromes presenting with this anomaly. Pediatr Dev Pathol 2000;3:568–83.
. Congenital diseases of intrahepatic bile ducts: variations on the theme “ductal plate malformation”. Hepatology 1992;16:1069–83.
. Abnormal cerebellar development and axonal decussation due to mutations in AHI1 in Joubert syndrome. Nat Genet 2004;36:1008–13.
. Joubert syndrome (and related disorders) (OMIM 213300). Eur J Hum Genet 2007;15:511–21.
. The ciliary gene RPGRIP1L is mutated in cerebello-oculo-renal syndrome (Joubert syndrome type B) and Meckel syndrome. Nat Genet 2007;39:875–81.
. The centrosomal protein nephrocystin-6 is mutated in Joubert syndrome and activates transcription factor ATF4. Nat Genet 2006;38:674–81.
. The Meckel-Gruber syndrome gene, MKS3, is mutated in Joubert syndrome. Am J Hum Genet 2007;80:186–94.
. The Meckel-Gruber Syndrome proteins MKS1 and meckelin interact and are required for primary cilium formation. Hum Mol Genet 2007;16:173–86.
. Mutations in INVS encoding inversin cause nephronophthisis type 2, linking renal cystic disease to the function of primary cilia and left-right axis determination. Nat Genet 2003;34:413–20.
. The NPHP1 gene deletion associated with juvenile nephronophthisis is present in a subset of individuals with Joubert syndrome. Am J Hum Genet 2004;75:82–91.
. [Cerebellar vermis hypoplasia with extracerebral involvement (retina, kidney, liver): difficult to classify syndromes]. Arch Pediatr 2001;8:186–90.
. Cerebellar and brainstem involvement in familial juvenile nephronophthisis type I. Pediatr Neurol 2003;28:142–4.
. Mutations in the cilia gene ARL13B lead to the classical form of Joubert syndrome. Am J Hum Genet 2008;83:170–9.
. Mutations in the AHI1 Gene, Encoding Jouberin, Cause Joubert Syndrome with Cortical Polymicrogyria. Am J Hum Genet 2004;75:979–87.
. Jouberin localizes to collecting ducts and interacts with nephrocystin-1. Kidney Int 2008;74:1139–49.
. Spectrum of MKS1 and MKS3 mutations in Meckel syndrome: a genotype-phenotype correlation. Mutation in brief #960. Online. Hum Mutat 2007;28:523–4.
. MKS1, encoding a component of the flagellar apparatus basal body proteome, is mutated in Meckel syndrome. Nat Genet 2006;38:155–7.
. Molecular diagnostics of Meckel-Gruber syndrome highlights phenotypic differences between MKS1 and MKS3. Hum Genet 2007;121:591–9.
. Aberrant splicing is a common mutational mechanism in MKS1, a key player in Meckel-Gruber syndrome. Hum Mutat 2007;28:638–9.
. Pleiotropic effects of CEP290 (NPHP6) mutations extend to Meckel syndrome. Am J Hum Genet 2007;81:170–9.
. Mutations of the CEP290 gene encoding a centrosomal protein cause Meckel-Gruber syndrome. Hum Mutat 2008;29:45–52.
. The transmembrane protein meckelin (MKS3) is mutated in Meckel-Gruber syndrome and the wpk rat. Nat Genet 2006;38:191–6.
. CC2D2A Is mutated in joubert syndrome and interacts with the ciliopathy-associated basal body protein CEP290. Am J Hum Genet 2008;83:559–71.
. MKS3/TMEM67 mutations are a major cause of COACH Syndrome, a Joubert syndrome related disorder with liver involvement. Hum Mutat 2009;30:E432–42.
. A novel locus for Meckel-Gruber syndrome, MKS3, maps to chromosome 8q24. Hum Genet 2002;111:456–61.
. CC2D2A, encoding a coiled-coil and C2 domain protein, causes autosomal-recessive mental retardation with retinitis pigmentosa. Am J Hum Genet 2008;82:1011–8.
. Human non-synonymous SNPs: server and survey. Nucleic Acids Res 2002;30:3894–900.
. Prediction of human mRNA donor and acceptor sites from the DNA sequence. J Mol Biol 1991;220:49–65.
. Joubert's syndrome with retinal dysplasia: neonatal tachypnoea as the clue to a genetic brain-eye malformation. Arch Dis Child 1984;59:709–18.
. Cerebro-oculo-hepato-renal syndrome (Arima' syndrome): a distinct clinicopathological entity. J Child Neurol 1986;1:338–46.
. Imaging findings in COACH syndrome. AJR Am J Roentgenol 1998;170:1081–2.
. Burkitt lymphoma in a child with Joubert syndrome. Pediatr Blood Cancer 2005;44:397–9.
. Cerebellar vermis defect, oligophrenia, congenital ataxia, and hepatic fibrocirrhosis without coloboma and renal abnormalities: report of three cases. Neuropediatrics 2002;33:180–5.
. Familial juvenile nephronophthisis with hepatic fibrosis and neurocutaneous dysplasia. Helv Paediatr Acta 1980;35:261–7.
. COACH syndrome: report of two brothers with congenital hepatic fibrosis, cerebellar vermis hypoplasia, oligophrenia, ataxia, and mental retardation. Am J Med Genet 1996;64:514–20.
. Hepatic insufficiency and liver transplantation in a patient with COACH syndrome. Pediatr Transplant 2002;6:443–6.
. Hepatic fibrosis, polycystic kidney, colobomata and encephalopathy in siblings. Clin Genet 1974;6:82–9.
. COACH syndrome associated with multifocal liver tumors. Am J Gastroenterol 2002;97:2664–9.
. Joubert syndrome with congenital hepatic fibrosis: an entity in the spectrum of oculo-encephalo-hepato-renal disorders. Am J Med Genet 1994;52:419–26.
. An autosomal recessive mental retardation syndrome with hepatic fibrosis and renal cysts. Am J Med Genet 1986;24:151–8.
. Successful combined liver and kidney transplant for COACH syndrome and 5-yr follow-up. Clin Transplant 2005;19:717–20.
. Mutational analysis of the RPGRIP1L gene in patients with Joubert syndrome and nephronophthisis. Kidney Int 2007;72:1520–6.
. Renal insufficiency is a component of COACH syndrome. Am J Med Genet 1996;61:122–6.
. The Joubert syndrome associated with bilateral chorioretinal coloboma. Eur J Pediatr 1980;134:173–6.
. Familial cerebellar ataxia and hepatic fibrosis—a variant of COACH syndrome with biliary ductal proliferation. Am J Hum Genet 1992;51(suppl.):A110.
. CEP290 mutations are frequently identified in the oculo-renal form of Joubert syndrome-related disorders. Am J Hum Genet 2007;81:104–13.
. Mutations in CEP290, which encodes a centrosomal protein, cause pleiotropic forms of Joubert syndrome. Nat Genet 2006;38:623–5.
. AHI1 mutations cause both retinal dystrophy and renal cystic disease in Joubert syndrome. J Med Genet 2006;43:334–9.
. Identification of the first AHI1 gene mutations in nephronophthisis-associated Joubert syndrome. Pediatr Nephrol 2006;21:32–5.
. NPHP1 gene deletion is a rare cause of Joubert syndrome related disorders. J Med Genet 2005;42:e9.
. A novel gene encoding an SH3 domain protein is mutated in nephronophthisis type 1. Nat Genet 1997;17:149–53.
. Dissection of epistasis in oligogenic Bardet-Biedl syndrome. Nature 2006;439:326–30.
. Evidence of oligogenic inheritance in nephronophthisis. 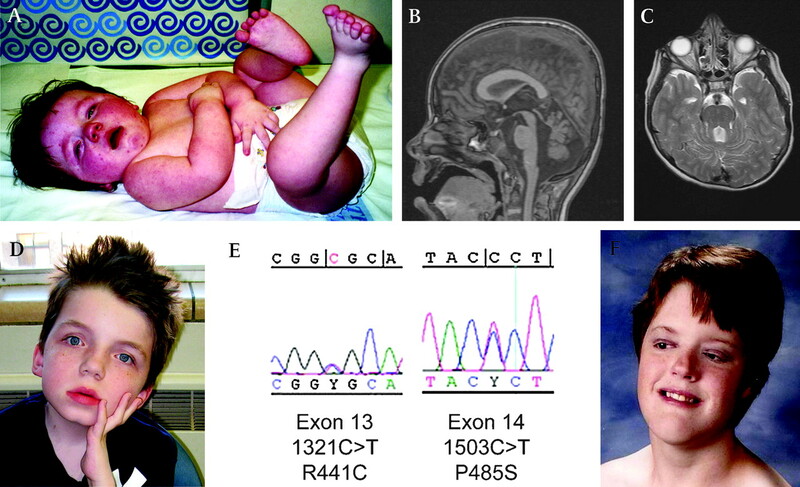 J Am Soc Nephrol 2007;18:2789–95.
. Triallelic inheritance in Bardet-Biedl syndrome, a Mendelian recessive disorder. Science 2001;293:2256–9.
. High NPHP1 and NPHP6 mutation rate in patients with Joubert syndrome and nephronophthisis: potential epistatic effect of NPHP6 and AHI1 mutations in patients with NPHP1 mutations. J Am Soc Nephrol 2007;18:1566–75.
. Autosomal recessive polycystic kidney disease and congenital hepatic fibrosis: summary statement of a first National Institutes of Health/Office of Rare Diseases conference. J Pediatr 2006;149:159–64.
. Renal disease in Arima syndrome is nephronophthisis as in other Joubert-related Cerebello-oculo-renal syndromes. Am J Med Genet A 2004;131:71–6.
. Nephronophthisis: disease mechanisms of a ciliopathy. J Am Soc Nephrol 2009;20:23–35. Funding This work was supported by the US National Institutes of Health (grants K23NS45832 to MAP, K24HD46712 to IAG, NCRR 5KL2RR025015 to DD, R01NS050375 to WBD), the March of Dimes Endowment for Healthier Babies (DD, MAP, and IAG), the Ames Endowment Fund at Seattle Children's Hospital (IAG), and the Allan and Phyllis Treuer Endowed Chair (PFC) at Seattle Children's Hospital.